Disarm Doors and Crosscheck: ON SPLENDOUR. AND WORDSWORTH. As the Splendour beast awakens each year, the North Byron Parklands become a hidden world inhabited by a wildly-dressed people who all seem to be in on an incredible 3-day secret. Walk the 1.5 kilometres from the car park to the festival entrance, step inside and it’s Narnia or Rivendell or John Malkovich’s head or wherever it is that Leonardo seeks in The Beach. Everything you know about the world shifts a tiny bit to the left. Or right. Either way, you’re not in Kansas anymore, only it feels good. I’m probably a bit older than the average Splendourer but the gorgeous young things didn’t seem too put out by the audacity of my 40-something presence. I was even complimented on my choice of footwear by one young fellow right after he loudly questioned my decision to wear mostly white. Who wears white to a festival? THAT guy! But, wait, his bowling shoes are WICKED. And they were wicked until the blister blitzkrieg hit a few hours in. In hindsight maybe he was taking the piss a little bit. Interestingly, in a 1993 interview with Australian Rolling Stone, Robert Smith - whose rocking set with The Cure on Saturday night at Splendour was a high point - spoke of Wordsworth and the classic Lake Poets saying that, “A lot of people say that classical poetry is dead, but I think that's only because it's not read in the right environment.” That is to say that, to truly understand it, one should read Wordsworth in the place whence it came. The assertion is that place adds meaning to the experience. The same can be said for Splendour - its setting is absolutely part of the magic. 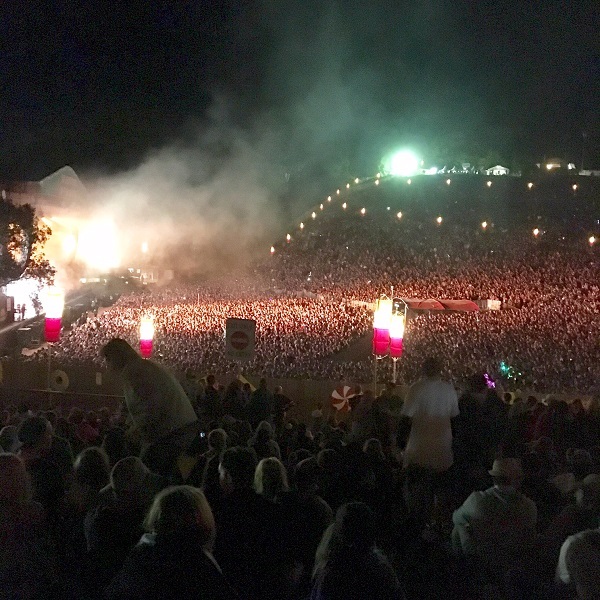 But there are whispers that Splendour has outgrown its current home (it’s certainly outgrown the toilets) and, given the seething, roiling mass of (mostly) young folk stretching the main amphitheatre to its limits, that may well be true. If Splendour does relocate, the blessed creatures may well ask Whither is fled the visionary gleam? Where is it now, the glory and the dream? Perhaps it's more a time than a place. Sounds like the first day of Splendour to me.